When athletes, corporate executives and weekend warriors want an integrated, powerful approach to performance, they call Mark Diaz at Physiqology. His experience in physical and mental preparation spans over 25 years. Mark’s specialty, in his own words, is “breaking fitness barriers”. Mark Diaz began strength training in the 6th grade because he wanted to be bullied less, he wanted the girls to like him more, and he wanted to be able to compete at a higher level in sports. He soon fell in love with weight training as an end unto itself, and used it as a springboard for participation in other athletic disciplines. Mark played football and participated in track and field throughout high school in Saugerties, NY. He graduated in 1989. After his discharge from active duty service in the Navy, he walked on to the football team at College of the Holy Cross in Worcester, MA. There, he played strong safety under the tutelage of Defensive Coordinator and Defensive Backs Coach Kevin Coyle, and Head Coach Mark Duffner from ’90-’91, and Defensive Backs Coach Bill McGovern and Head Coach Peter Vaas from ’91-’92. Obligations to the United States Naval Reserve Officers Training Corps, academics, and the painful reality that he was not going to be a professional football player ended his football career in 1991. In 1994, Mark graduated Holy Cross with a Bachelors of Arts. He also graduated with an insatiable desire for knowledge of sports performance enhancement. 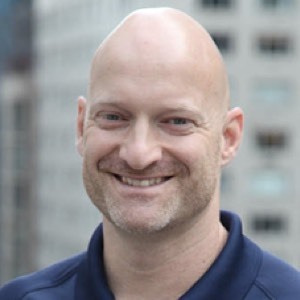 In 1994, he became a certified personal trainer through the American Council of Exercise (ACE), and in 1995, a Medical Exercise Specialist (MES) through the American Academy of Health, Rehab, and Fitness Professionals (AAHRFP). Mark’s first job as a personal trainer was in his adopted hometown of New Paltz, NY. He soon produced top numbers in training at his local club, and was hired as a part-time strength coach for the baseball and swim teams at State University of New York at New Paltz. Mark moved to New York City in 1996. He worked as a personal trainer at both Crunch Fitness and Equinox, and became a top producer and leading authority at both clubs. Also in ’96, Mark became a Certified Strength and Conditioning Specialist (CSCS) from the National Strength and Conditioning Association (NSCA), the only internationally accredited certification in the industry. He held this certification until 2010. Mark formed his first personal training company – Triskelion Strength – in 1997, and worked as an independent personal trainer until approximately 1998, when he met Charles Poliquin. From that moment, Mark decided that he would elevate his professional skills to the level of strength coach. Mark Diaz ex-terned with Charles Poliquin four times in three years from 2001 to 2004. During that time, he received a formative education in top level sports performance enhancement, including work with top athletes from the NFL, NHL, and PGA, as well as experience in training athletes for the Olympic sports of bobsleigh, hockey, long jump, luge, pole vault, shot put, and sprinting. For his work at the Poliquin Performance Center, Mark Diaz was designated as a Level II, or regional coach, in 2006, became the only Level II coach allowed to teach the Poliquin International Certification Program curriculum during its early development. Mark Diaz became a PICP Level 4 coach in 2010. The Level 4 PICP certification is earned when an athlete instructed by the coaching candidate succeeds in competing in either a World Championships or an Olympics in that athlete’s respective sporting discipline. This level of coaching expertise is reached by less than 1% of 7,000 candidates. During 2006 and 2007, Mark studied with French Doctor of Osteopathy Guy Voyer, and became one of the first people in the United States to earn an official designation in Soma Training. The Soma Training degree is equivalent to a physical therapist designation, though it carries no official license in the United States. In 2009, Mark completed a six-month post-doctorate level course in clinical nutritional evaluation and diagnosis – Integrative Assessment Technique™ – with IAT founder Loren Marks, DC. Mark took this training, along with his experiences working with other doctors, and with clientele from all walks of life, and created the Comprehensive Physiqology Assessment. The Comprehensive Physiqology Assessment is the only assessment in the personal training industry today that creates a needs-based hierarchy of training programming, and marries it with needs-based nutritional programming using the discipline of applied kinesiology. Mark Diaz’ athletes produced nine National Championship medals in two countries across six Olympic sports disciplines. They have competed in World Championships and the Olympics. In 2016, Mark was hired by the Washington Nationals to consult with the team’s medical staff in the realm of sports performance. This opportunity launched a working relationship with Dr. Keith Pyne, Chair of the Washington Nationals Medical Review Board. Mark Diaz and Dr. Pyne share similar ideas regarding the training of athletes for sport, and subsequent work together resulted in a partnership in a project designed to elevate rotational sports performance across all its disciplines. ForeMovement will address the mobility and strength requirements of golfers in an online, subscription-based model using a system of Key Performance Indicators that is the result Mark’s and Keith’s 50+ combined years working in sport and physical performance. It is slated for release in 2019.